Facial recognition, multi-touch, online avatars, limited edition designs – 2009 tech gear promises to balloon your ego, enhance your style and even, occasionally, help you get something done. Here’s some of the you-centric gear that Thursday’s PepCom show at Manhattan’s Hammerstein Ballroom had on display. 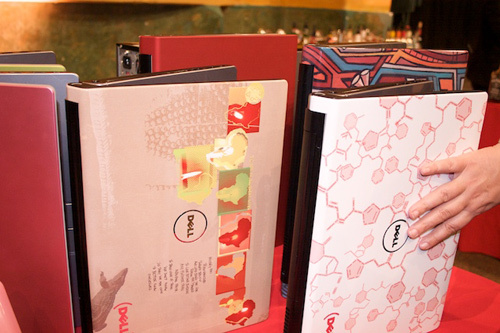 Sick and tired of being the progenitor of boring, ubiquitous business notebooks, Dell is showing off their line of artist-designed consumer laptops. The Art House laptops, which come in about a zillion different colors, designs and patterns, can be either designed online by customers themselves or built-to-order from amongst a huge selection of artist-created lids. They’ll ship in 2009, and cost $649 and up. Dell also showed off some new gear from its Alienware gaming brand. Along with several existing models sporting trumped-up guts – Core i7 processors, multiple videocards, enterprise-sized hard disks – Alienware was also demonstrating a new feature on its webcam-equipped notebooks: facial recognition login. Sit down at the machine, and the camera sizes up your face immediately, measuring the distances between key points on your dome – eye to eye, nose to chin, and so forth. Even if you grow a beard or gain 30 pounds, these measurements stay constant, so there’s no risk that your machine will forget who you are. In the event that you have reconstructive surgery to outwit the FBI, there’s always the fingerprint scanner on the palmrest. AsusTek churns out notebooks so fast that I half expected to see a new one show up by the end of the PepCom show. But if one did, I wouldn’t have noticed; I was too busy fawning over their special-edition bamboo notebook, which has just been made available for pre-order though Amazon. 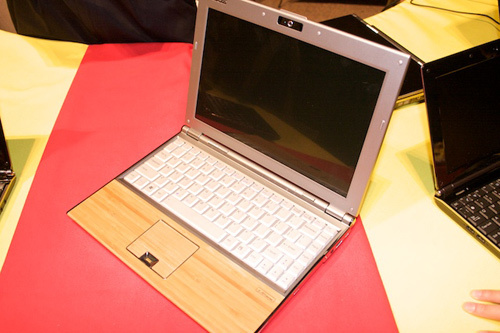 It’s a variation on Asus’s existing U6 machine, but made of recyclable materials and actual bamboo veneers, even down to the touchpad and mouse buttons. The machine packs a formidable spec: 2.53GHz Intel T9400 processor, 4GB of RAM, 320GB hard disk, Nvidia 9300M graphics, and Microsoft’s Vista Business. Amazon is listing it for $1900. Iomega was on-hand demonstrating their line of portable eGo hard drives, which come in a series of finishes sure to match at least one facet of your personality: camouflage, New England Patriots-themed, brown leather-bound, and, well, plain black metal. The surprisingly light 250GB drives are drop-resistant, and with an optional rubber sling, can survive falls of up to 7 feet. 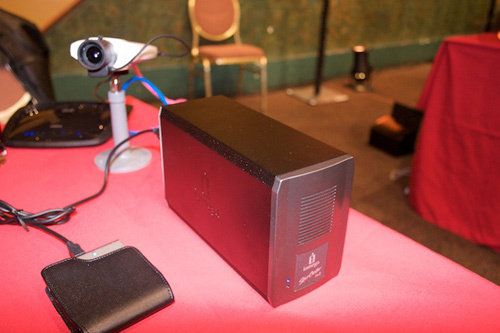 Also on display was the company’s hardy StorCenter ix2 network hard drives, which come in one or two terabyte configurations, act as a media server, and even take direct video input from a home security camera. The company also showed off its ScreenPlay media link, a clever little infrared gizmo that comes with a dedicated remote. Connect it to your TV, and link up one of your eGo drives with some multimedia on it, and you can browse and play your files over your TV. Over at the HP table, style was abundant. 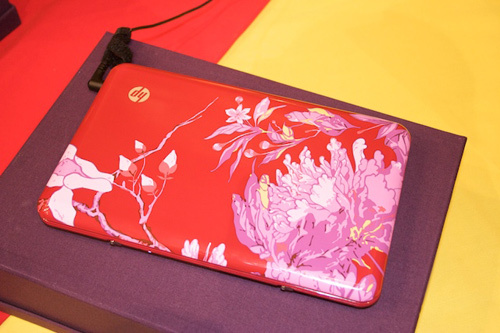 The company was showing off its new line of Mini netbooks, one of which has a gorgeous red enclosure designed by Vivienne Tam that is made to look like a woman’s clutch. (Oddly enough, it really does.) Sporting an Intel Atom processor running at 1.6GHz, a 10.1-inch display, the Mini 1140NR, as it’s called, will sport a similar footprint to its Mini siblings. Price has yet to be disclosed, but the device should ship next month. 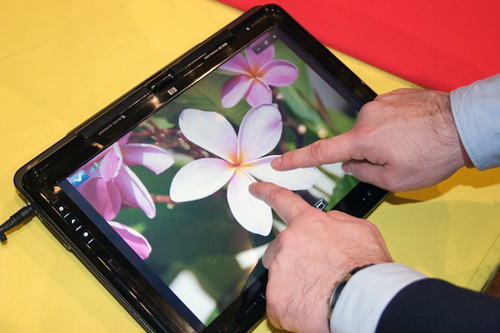 Also on display was HP’s new MediaSmart notebook, a cousin of its finger-operated TouchSmart PC. For better or worse, this notebook converts to tablet form, and is not only equipped to be operated with fingers, but also an included stylus. While notebook design is a matter of opinion, there’s no doubting that while the machine packs powerful hardware, its convertible design makes it much bigger, heavier, and more unwieldy than a touch-screen device should rightfully be. Nevertheless, the MediaSmart notebook acquitted itself admirably, reacting quickly and accurately to finger input, and showing that HP’s prowess in the user interface department has all but exceeded Microsoft’s. 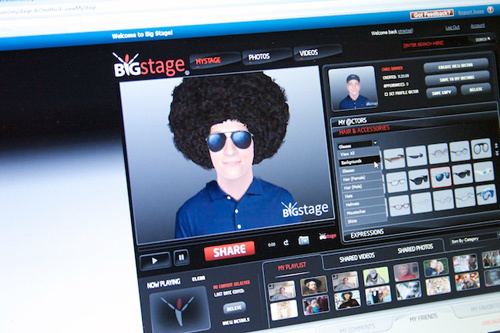 Every PepCom event brings out a surprise player, and this week it was BigStage, a Web-based application that allows you to make an online avatar of yourself. Your avatar can be customized with a litany of hairstyles, bodies and accessories, and tossed into an ever-growing amount of content: movie trailers, photos, video games, and the like. This doesn’t sound like a big deal until you actually see it work. From three digital photos that Founder Jonathan Strietzel snapped of me on his point-and-shoot camera, a frighteningly realistic and 3-dimensional model of my head appeared on the screen in minutes, ready to be altered with any expression – that’s right, it can change your facial expressions – that I saw fit. He gave me an afro, then a monkey body; made me look sad, then surprised; had me speak dialogue with a realistically-moving mouth, and inhabit a number of characters. This isn’t the flat-face photo technology you see in sports games, where your player has a passing, pixelated resemblance to a real pro. No, no. It’s your face. BigStage is opening itself up to any company that wants to port their avatars, so you may see these things appearing everywhere from Xbox to Facebook before too long.